The single-family rental (SFR) space has quickly quieted skeptics and scaled into an institutional asset class. Build-to-rent (B2R) is now playing an emerging role in the industry’s evolution. 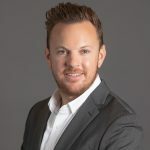 In less than a decade, Progress Residential, Tricon American Homes, Front Yard Residential, American Homes 4 Rent, and Invitation Homes have all solidified proof of concept for the SFR industry. Several of these industry leaders are now targeting B2R as part of their growth initiatives. However, a new group of operators is pursuing B2R as a standalone business model. Leading the B2R charge are NexMetro, AHV Communities, BB Living, Christopher Todd Communities, and Camillo Homes. There’s no one-size-fits-all model, which we discovered after visiting and/or analyzing 50 open and planned B2R communities consisting of over 6,000 homes. Full-service B2R model: On-site leasing experts supported by up to three model units. Services include property management, 24-hour maintenance, lawn service, and trash valet. Amenities can include gated entrances, private streets, pools, and parks. Minimal B2R model: Akin to traditional single-family detached neighborhood with virtually no amenities or on-site services. 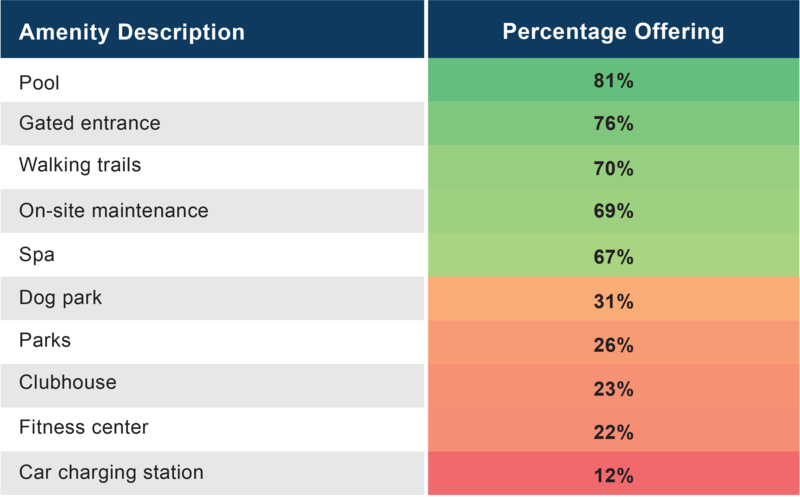 70% of the B2R communities we analyzed lie in A or B submarkets. What we found is that these renters want to live in the same general locations as those looking to buy a home. They want convenience to shopping, safe neighborhoods, proximity to job centers, and good schools. B2R communities are adjacent to for-sale communities. The economics of B2R are allowing rental operators to match or beat for-sale home builders when it comes to many land deals. 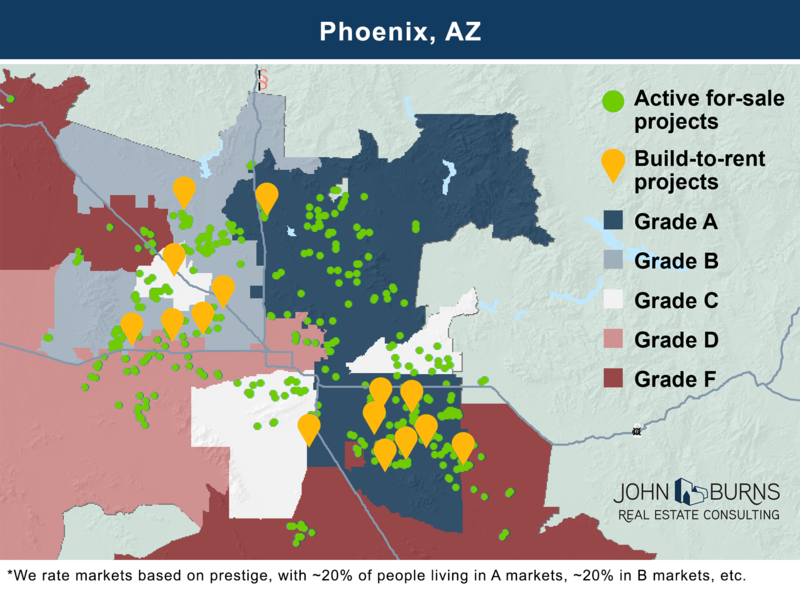 The locations of the open B2R communities (orange pins) and the active for-sale neighborhoods (bright green dots) demonstrate these housing solutions are vying for the same locations, most of which we rate as A or B submarkets* in the Phoenix MSA. Focus on durable, low-maintenance products throughout the home. Most of the projects we toured included laminate or tile faux wood floors, granite kitchen countertops, solid-surface bath counters, and fiberglass tub/showers. Make small spaces feel large and private. 9+ foot ceilings created a sense of openness in many of the B2R communities we toured. Private yards are also key, though small enough to keep rents affordable and maintenance costs manageable. Residents don’t want anyone living above them, as if often the case for most apartment renters. 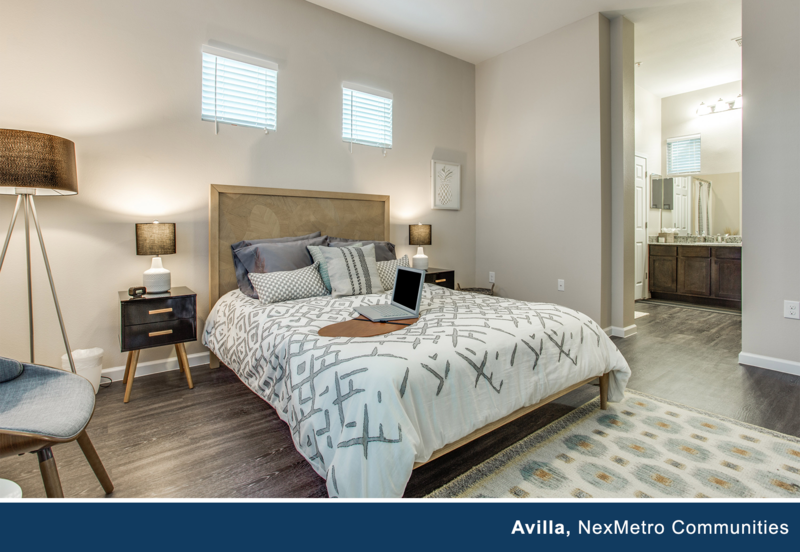 The interior photos of one of NexMetro’s open B2R communities highlights the quality of materials used in their homes. 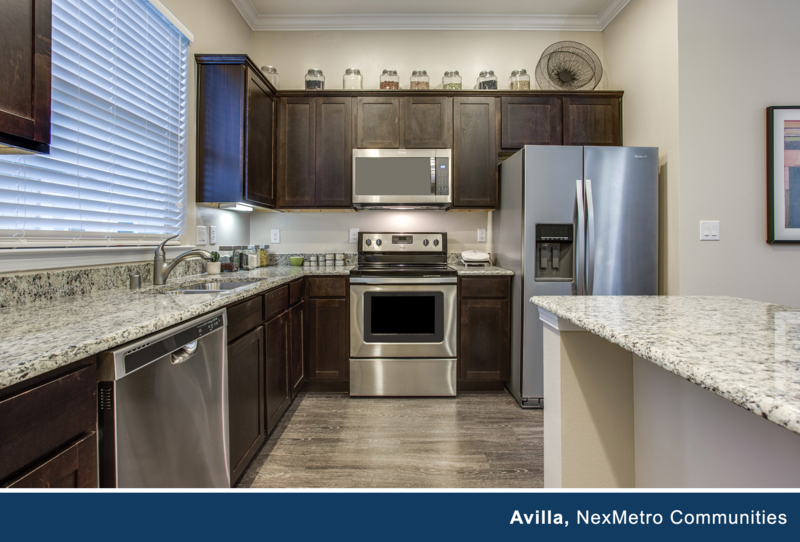 Including granite counters, laminate wood flooring, and stainless steel appliances appeals to their residents while providing durability and lower cost of maintenance to the owner. 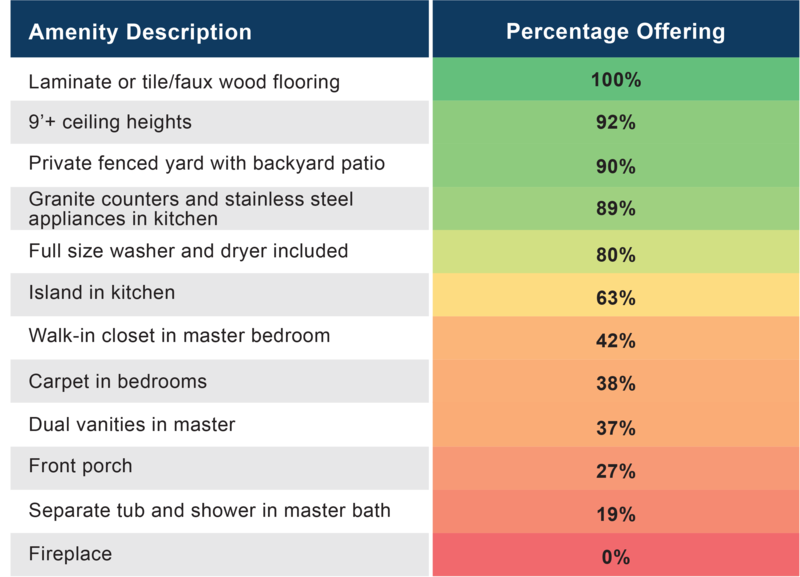 In addition to the interior unit amenities, we also analyzed B2R community amenities. Pools, gated entrances, walking trails, and 24/7 on-site maintenance were most common. 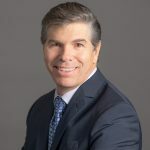 Economics rarely support clubhouses/fitness centers, and knowing your target renter profile’s affordability thresholds is critical when deciding which amenities to offer. We are proud to have been involved with the SFR industry since 2010, helping on portfolio acquisitions, IPOs, and now B2R communities. When we conduct Burns Plus Feasibility studies, whether for rent or for sale, we are careful to survey the likely occupants, recommend the appropriate specification level, and often use photos from DesignLens™ or neighboring communities. If you would like additional help separating fact from fiction in the B2R space, please reach out to us. If you have any questions, please contact Don Walker at (858) 281-7211 or by email.